An important opposition figure is shot dead in the capital of a country dominated by a single party. While the world mourned the death of Russian opposition leader Boris Nemtsov in Moscow, little attention was paid to the murder a week later of Gilles Cistac in Maputo, Mozambique. Cistac, a Mozambican of French origin, had in his many years in the country risen to become one of its top constitutional experts and leading academic. Cistac had opined in an interview that legitimate constitutional basis existed for demands by RENAMO (Mozambique’s main opposition party) for the devolution of political and financial power. Leaving a café one morning, he was shot down by an automatic weapon fired from a passing vehicle. Despite the fact that Cistac had worked as an advisor to the ruling FRELIMO government for years, many on social media had lashed out at Cistac following his statements. FRELIMO spokesperson Damião José had called Cistac, a professor at the country’s Eduardo Mondlane University, an “ingrate”. Weeks before the murder, Cistac had been receiving death threats on social media including one from “Calado Calachnicov” (Portuguese for "silent Kalashnikov”). At stake is the potentially billions in revenue from recent hydrocarbon and coal discoveries in what was last year one of the world’s fastest growing economies. 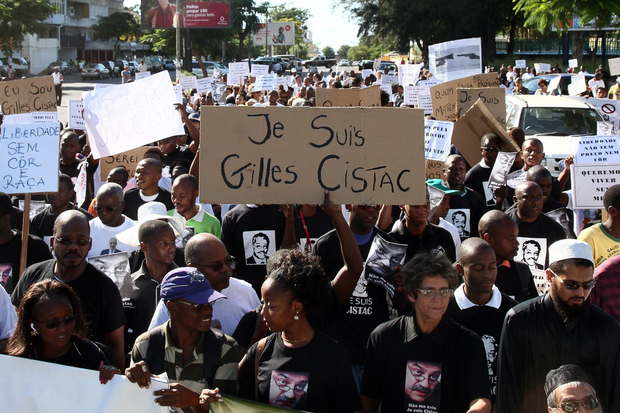 The murder sparked demonstrations in Maputo and elsewhere in the country where some demonstrators held placards that read “Je Suis Cistac”. For many in Mozambique the death of Gilles Cistac recalled the 2000 slaying of investigative journalist Carlos Cordoso. Both men were killed by drive by shootings in the upscale Polana district of Maputo, Mozambique’s capitol. At the time, Cordoso had been investigating a $14 million embezzlement case involving the privatization of the Commercial Bank of Mozambique (BCM), the largest in the republic. individuals involved in the Cordoso slaying have themselves been murdered. Vicente Ramaya, the manager of the BCM branch where the crime occurred, was shot and killed in Maputo in February 2014, a year after his release from prison. In July 2014, Ayob Abdul Satar, a businessman convicted of ordering the murder of Cardoso, was killed in Karachi when he was shot leaving a bank. The shooting of Giles Cistac has led to a new round of tension between RENAMO and FRELIMO. The two sides fought sporadic skirmishes in 2013 and 2014. The most serious violence in the country since the end of the civil war between RENAMO and FRELIMO in 1994. Despite being home to vast resources, including tourism and hydrocarbons, Mozambique continues to receive as much as half a billion dollars in aid per year in direct budgetary support from international donors. The international community, which helped foster Rome General Peace Accords that brought to an end a civil war that had claimed roughly a million lives, must now help foster more than a cartoon democracy in the country. An effort should be made to ensure that the country does more to protect civil liberties. These include the right to free speech, a cause for which Carlos Cordoso and now Giles Cistac both gave their lives.